Dr. Amerian and Dr. Anterasian are proud to announce that the Thermage procedure has been upgraded and the new upgraded technology is now available at the Santa Monica Laser and Skin Care Center! The most recent Thermage upgrade is called Thermage CPT. CPT stands for “Comfort Pulse Technology.” With this technology, Thermage has become a much more comfortable and much more effective procedure for skin tightening. There are two ways in which Thermage CPT improves patient comfort. First, instead of one continuous unbroken pulse, the CPT technology breaks up the Thermage pulse into a series of micro-pulses. Second, the CPT technology delivers the Thermage pulses with vibration. The vibration reduces the sensation of heating, which also leads to improved patient comfort. The greatly enhanced patient comfort allows us to make many more passes over the tissues. Depending on the area being treated, we now make 8-12 passes over the tissues with Thermage CPT instead of the 4-5 passes that we used to make with the earlier generation of Thermage. In addition, the heating profile has been enhanced with Thermage CPT to deliver much more even and uniform heating of the tissues. It is this enhanced heating profile combined with the increase in the number of passes that is responsible for the improved effectiveness of Thermage CPT over earlier generations of Thermage. As a result, Thermage CPT treatments are not only much more comfortable for our patients but also much more effective than the earlier generations of Thermage. Ideal candidates for Thermage CPT have mild to moderate skin laxity in the face or neck. Any of our patients who would like to investigate Thermage CPT treatment are invited to call our office for an appointment. 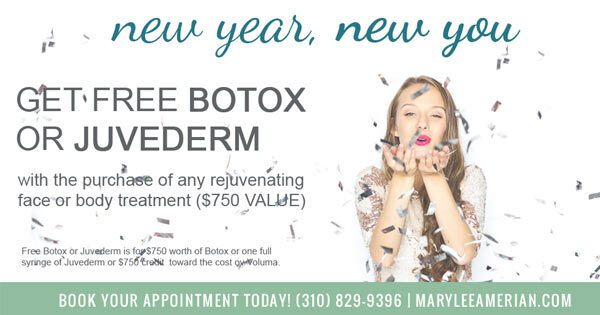 Most of our patients have already experienced the benefits of Botox and Juvederm. These treatments give a dramatic reduction in facial frown lines, wrinkles, and skin folds and help our patients look refreshed and rejuvenated. When properly done, a treatment with Botox and Juvederm gives a completely natural appearing facial rejuvenation. 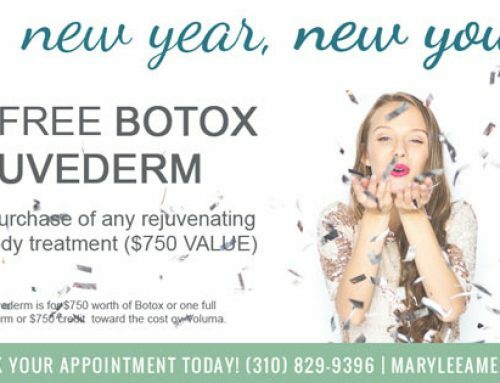 As we head into the holiday season, Dr. Amerian and Dr. Anterasian are very pleased to make available to our patients the following special offer: We will give a $75 discount on your next Botox treatment or your next Juvederm treatment. If you do both treatments, you will receive a savings of $175. Please call our office at 310-829-9396 to take advantage of any of these special holiday opportunities. These savings will be in effect until December 31, 2010. We are happy to inform our patients that the FDA has now approved the Coolsculpting by Zeltiq procedure for non-invasive fat reduction! The approval was announced on September 8, 2010. This is the first time the FDA has ever approved a non-invasive fat reducing procedure. The Coolsculpting procedure reduces fat by chilling it for one hour. Ideal candidates for the procedure have discrete and localized fatbulges on the abdomen, love handles, inner thighs, and back. Coolsculpting treatments result in noticeable and natural looking fat reduction in the treated areas. The procedure is done by applying the Coolsculpting applicator to the fat bulge for one hour. During this time, the applicator chills the fat. The exposure of fat cells to cooling begins a process of natural fat cell removal. Patients remain very comfortable during the time the applicator is on the skin. The Coolsculpting by Zeltiq procedure is extremely safe. There is minimal discomfort during the procedure, and absolutely no down time after the procedure. Most patients resume their normal activities, including returning to work and exercise regimens, immediately after leaving the office. Three months after the first procedure, if a patient wishes, the procedure may be repeated to further enhance the result. Alternatively, other areas of the body may also be treated with Zeltiq. Coolsculpting by Zeltiq represents a new and very exciting way of accomplishing fat reduction in a completely non-invasive manner. Because of its safety, FDA approval, consistent results, and easy recovery, Coolsculpting has become a very popular method of reducing fat on the abdomen, love handles, inner thighs, and back. If you would like to discuss whether you are a candidate for the Coolsculpting procedure, please call our office at 310-829-9396 for an appointment. Good news from Zeltiq! The Zeltiq device has now been upgraded to allow the entire abdomen to be treated in only one treatment cycle. With the new upgrade, patients can now treat fat bulges on the abdomen much more quickly and easily. Up until now, most patients required two or three Coolsculpting cycles to treat the abdominal fat. Since each cycle requires one hour, most Zeltiq appointments lasted two or three hours. With the new upgrade, treatment times are significantly reduced and office visits are much shorter. Most patients now require only one hour to treat their abdominal fat bulges. This allows our patients to use their time much more efficiently.